The Prussian master sculptor Moritz Geiss is believed to have cast the statue of the Greek mythological figure Niobe circa 1860. Geiss was an early innovator in developing zinc statuary, which he popularized during the second half of the 19th century. Zinc statues were painted white to create the illusion that they were made of marble. This technique unquestionably created a lustrous effect. The plaster mold that Geiss used to cast his statue was taken from a statue of Niobe at the Uffizi Gallery in Florence, Italy. The Uffizi’s statue is a Hellenist work discovered during the Renaissance, and is itself a copy of a much admired 5th century, B.C. original that was lost in antiquity. Geiss’ Niobe was advertised for sale at the London Industrial Exposition in 1862 (together with zinc statues of the twin Greek dieties, Diana and Apollo, who were antagonists in the Greek myth of Niobe). An anonymous purchaser, believed to be Isaac Adams, bought all three statues. Adams was known to be travelling in Europe at the time and was anecdotally reported to have bought his statuary there. Geiss’ Niobe is approximately one and a quarter life-size. She originally stood on a 20-foot tall stone pedestal at 24 Little Pond Road, Sandwich, NH. From 1875 to 1941, the statue of Niobe was a popular tourist attraction in Sandwich and a source of great civic pride. 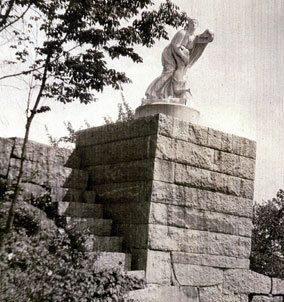 In honor of Niobe, the slope where the statue stood was named “Image Hill”. In 1941, the statue fell over and shattered into almost 200 pieces, some as large as a person, others as small as a thumbnail. The statue’s faulty original installation caused this disaster. The statue had been sleeved over a wooden block, which was bolted to the stone pediment. Over the years, seeping water had rotted the wooden block, with unfortunate results. 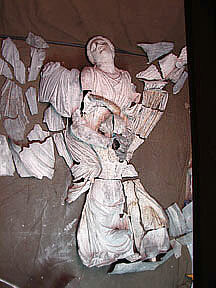 Luckily, the owners of the statue collected all of the broken pieces and saved them. The whereabouts of those pieces was forgotten with the passage of time. When the Porter family acquired Adams Hall in 2004, the purchase contract specified that the statue of Niobe, if it could be found, was to be sold with the property. Months later, the lost pieces were discovered under a manure pile in a horse barn behind the old Isaac Adam’s estate in Sandwich. Putting the pieces back together, however, seemed out of the question due to the extensive damage. 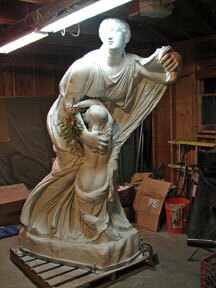 In 2011, Adam Nudd-Homeyer, a metal artisan who resides in Sandwich, developed a plan to restore Niobe. Consulting with Carol Grissom at the Smithsonian Institution’s Museum Conservation Institute, Mr. Nudd-Homeyer tested and proved the efficacy of a variety of techniques to complete the restoration. The beautifully restored statue is a testament to Mr. Nudd-Homeyer’s skill. The restoration was a difficult task. The metal pieces had to be put together like so many jumbled pieces of a jigsaw puzzle. In many cases, the pieces were severely distorted and very brittle. Mr. Nudd-Homeyer had to reshape them to their original form with great care to avoid causing further damage, and to fashion new pieces to fill voids. Mr. Nudd-Homeyer also needed to correct structural defects from the original casting. As noted above, Isaac Adams also purchased Geiss’ castings of Diana and Apollo. The plaster cast of the statue of Diana was taken from Praxiteles’ original 5th century, B.C. masterpiece on display at the Louvre in Paris, France. Diana stood on the south side of Isaac Adam’s estate, where her pedestal still remains. She was sold at an estate auction in 2010, and her current whereabouts are unknown. Nothing is known of the statue of Apollo. There are no known depictions of it nor is there a record of its ultimate disposition. In Greek legend, Niobe was the daughter of wealthy King Tantalus. Niobe married Amphion, and they were the first king and queen of the city of Thebes in central Greece. Niobe had fourteen children, seven sons and seven daughters, of whom she was inordinately proud. Her pride caused her downfall. Niobe was punished by the gods for her hubris, which she disastrously displayed on the feast day of the goddess Leto. Specifically, Niobe mocked Leto and refused to participate in the religious ceremonies honoring the goddess. Niobe justified her haughtiness because the goddess was neither richer nor more powerful than she (or so Niobe thought). After all, Niobe was the heir of rich King Tantalus and was a queen. Furthermore, Niobe claimed to be seven times more blessed than Leto because Niobe had fourteen children compared to Leto’s two. Leto found Niobe’s behavior intolerable. To avenge their mother’s honor, Leto’s twin children, the sun god Apollo and the moon goddess Diana, rained down arrows, slaughtering all of Niobe’s children before her very eyes. Hearing Niobe’s wailing, Amphion rushed to the scene, and apprehending that his wife had deeply offended divine authority, fell on his sword. The gods, however, were not satisfied that the complete destruction of Niobe’s family was sufficient punishment for her sin. As an additional measure, they transformed Niobe into stone and commanded that she weep perpetual tears. WHY DID ISAAC ADAMS CHOOSE THE STATUE NIOBE? Isaac Adams left no known record why he chose Niobe to overlook the Great Wall. We can only speculate as to his reasons. One theory harkens back to an oft-told story of his youth. When he was nineteen, Adams decided to leave Sandwich and resettle in Boston, where there were greater economic opportunities. Adams asked his neighbors to lend him the coach fare, which he would repay once he got a job in Boston. His neighbors refused this request, telling him that he was of “no account” and they would never see him or their money again. Bristling at this rebuke, Adams swore that he would work his way to Boston, become successful, and return to Sandwich rich enough to buy any land he wanted. Adams kept his vow. After inventing the steam-powered press that revolutionized printing, he returned to Sandwich a multimillionaire. He bought up many farms in the Sandwich Lower Corner neighborhood and proceeded to knock down all their buildings. Some of the feathered split granite that made up those buildings’ foundations found their way into the Great Wall Adams constructed in 1874-1875. Perhaps this was Adams’ way of likening himself to the ancient Greek gods and saying to the citizens of Sandwich, “You were wrong to mock me as a ‘no-account youth.’ In fact, you should look up to me with great deference because I have far more power and wealth than any of you could ever hope for.” Rather than punishing his neighbors by mowing them down with arrows, like Apollo and Diana in the myth, Adams merely bought and destroyed their homes, his symbolic equivalent. He may have placed the statues of Niobe, Apollo and Diana along the Great Wall, itself an emblem of his power and wealth, to constantly remind townsfolk of his message. The Great Wall is a massive structure, that is generally shoulder high and 10 feet wide. Isaac Adams had it constructed between 1874-1875 by approximately eighty men working under the supervision of two master masons: Jacob Roberts of East Sandwich, who was the chief, and Curt Prime of Moultonborough, his assistant. The Great Wall has several disconnected branches, and in the aggregate, extends over a mile. Its core structure is trapezoid shaped and encloses almost twenty acres. During the period 2004-2009, dense vegetation was cleared away and the Great Wall was repaired. Visitors now can easily walk around the Great Wall at their leisure. In addition to the stone recycled from the foundations of demolished buildings, the stone used to build the sides of the Great Wall came from both split boulders located on the surface of the land and from small quarries located just outside the Great Wall. One such quarry is located northwest of the core structure, and another is located just outside the southeast corner. Large pieces of stone were broken off ledge shelves by steam drills, and then hand split with star drills into “feathered” pieces. The interior of the wall is filled with small stones combed from the enclosed field, which has since largely reverted to secondary forest. 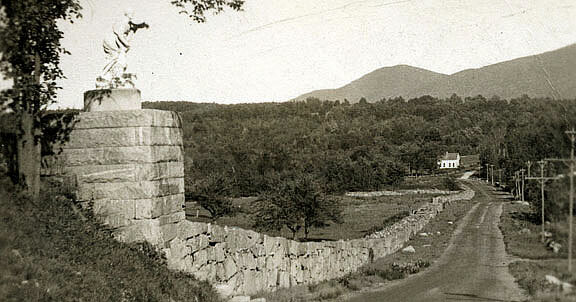 Some of Adams’ contemporaries criticized him for building the Great Wall. They thought that the good wages Adams paid lured small farmers away from the land. Thus, he was blamed for the decline in the area’s agriculture, as his workmen first neglected their farms, then eventually left Sandwich to obtain mill jobs in larger towns or to homestead the rich farmlands of the Midwest. These criticisms appear to have no merit; they merely lay blame on one man for the inevitable shifts in the economy of late 19th century New England. The Great Wall incorporates some interesting hydraulic features. Portions of the wall originally collected and channeled water into subterranean pipes that fed downhill wells. The natural surface streams within the Great Wall were also channelized into underground pipes that, to this day, discharge water outside the wall. The Great Wall also encloses a natural “bowl” that is fed by two uphill streams, which mysteriously disappear into the ground as they flow downhill. At the bottom of the “bowl” there is a cut stone drain hole that empties into a stone pipe. The intended purpose of this latter structure is unknown. One answer might be that the “bowl” was used for fish farming. Adams is reputed to have dumped salt in nearby Little Pond in a futile attempt to farm lobsters. Perhaps, but that story seems no more likely than the story that he built the Great Wall 10 feet wide so he could drive his horse carriage around its top. It would seem much more probable that he created a fresh water fish farm in the “bowl.” The “bowl” could have been easily drained when the fish matured, and the catch could have been harvested by hand. If this is the correct answer, the myth of the “lobster” farm might have arisen if some crayfish were hand gathered along with the fish. After all, this is how crayfish are, in fact, harvested for human consumption in Louisiana. It is easy to see how somebody may have mistaken a crayfish for an immature lobster and given birth to a fantastic story. Adams Hall is located in the Sandwich Lower Corner neighborhood. It was built in 1848 to house four artisan shops on the ground floor and a dance hall on the second floor. Originally located farther up Wentworth Hill near the School House Road intersection, the building was subsequently purchased by Isaac Adams. Adams moved the building to its present site in 1875, when he made it part of his estate. Over time, Adams Hall and the surrounding acreage were subdivided from Adam’s estate. The building was extensively renovated and improved during 2004-2006, and is now a lovely residential property with outstanding views of the Ossipee Mountains.